Huawei MT880 CPE and Huawei MT882 CPE are modems with DHCP function. So these modems have the benefits of routers. We do not need to purchase a router to share the Internet connection between computers if we have Huawei MT880 CPE or MT882 CPE modems. This tutorial explains the procedure to configure Huawei MT880 CPE & MT882 CPE modems without using setup disc. Before starting to set up Huawei CPE modems, make sure you have the username and password provided by your ISP. It is not the device log on details but the broadband connection username and password. If you don't have them right now, you must contact your ISP before proceeding to the next steps. You will be prompted to enter the username and password. Select the box Default Route ‘Enabled’. Scroll down the screen and locate Username and Password fields. Enter the username and password provided by your ISP. If you don't have them, you must contact your ISP. You may need to restart the Modem for proper working. Since Huawei CPE modems have routing feature, you need to learn router cascading before connecting another router to the modem. 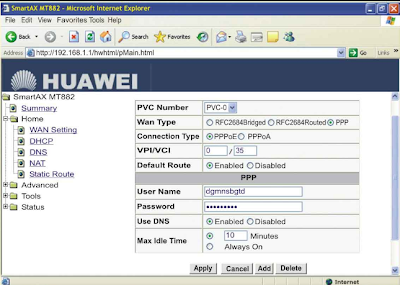 To learn more about connecting an additional router to Huawei modem, visit the link below. To check whether the Huawei modem is configured correctly and connected to the Internet, visit the link below and follow the instructions provided there. i hav a problem. i need help. problem is tat wen i try tat ip address i.e 192.168.1.1 its not getting connected...nw how to connect..?? i hav a problem...can u plz help me...problem is tat wen i try to connect to tat ip addraess..ie 192.168.1.1 its not getting connected dono y?? ?plz help me..
ping 192.168.1.1 and make sure that you are getting valid replies. First of all please make sure that the router IP address is 192.168.1.1 by referring the router manual. If you cannot make sure it please try the number below. Or disconnect power cable from the router for 30 seconds and connect it back. When the LAN light is steady on the router try top access the web based setup page. Ok cool, i can get in, but how safe is this?? wont the service provider realize this?? ?